Set over six floors, each with floor-to-ceiling windows, the chalet fuses traditional alpine charm with modern design and architecture. In addition to the luxurious setting, guests enjoy an awardwinning fully-inclusive package with full compliment of staff including private gourmet chef, concierge and service staff. 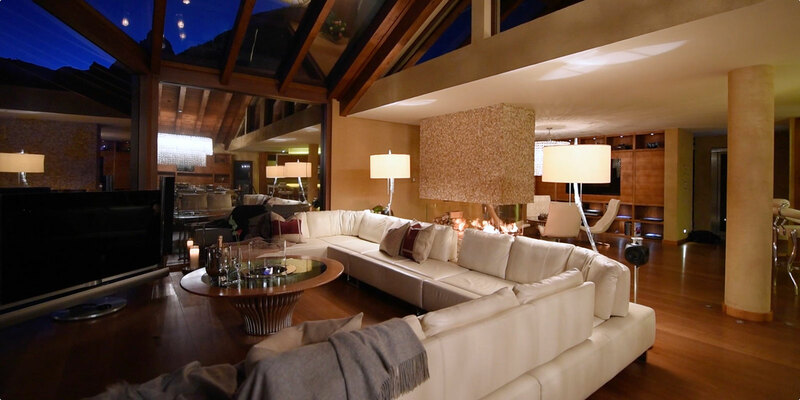 Situated in one of the world's most desirable locations, this is a unique opportunity to rent an exceptional fully serviced chalet, with award-winning staff and service for the holiday of a lifetime. The living areas have been extensively interior designed, to include many bespoke pieces of furniture and unique artefacts and artwork. The library area offers additional cosy fireside seating, perfect for afternoon tea and relaxing after a long day on the slopes. Brand new in 2018 is our state-of-the-art TechnoGym®. Here you will find all the latest equipment, with integrated TV's and Bluetooth connectivity. Finish your workout with power-showers to refresh and revive.